Sam Spencer was nominated by Instructor Erica because of his spirit, drive, and consistency as a rider at BESPOKE! What made you search for an indoor cycling studio? In March, my annual physical didn’t go well. I have done a dozen marathons and have always been active and athletic, but injury and just plain laziness were catching up with me at age 56. My weight and lab results led my doctor to recommend going on medications to mitigate my risk of future problems, but I suggested he give me a few weeks to attack the situation with modifications to my diet and exercise regimen, among them replacing all my ‘days off’ with spin classes at Bespoke. I bought an introductory pass and dove in. How long did it take you to see major changes? Ten weeks later, I had dropped 25 pounds, normalized my blood pressure and blood sugar, and shaved 70 points off my cholesterol. Even better, as I write this in October, I have kept the weight off – I’m down 30 pounds now – and the changes I made are now entrenched as habits. I turn 57 this month, and I have the weight and physique I had at 25. 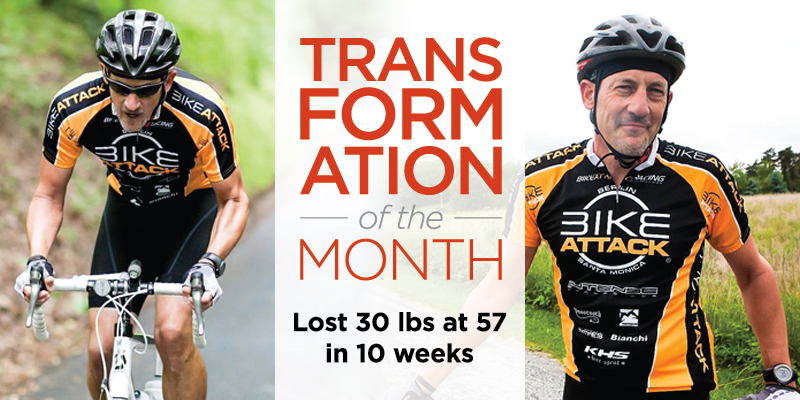 What was the most important part of your transformation? Becoming a BESPOKE regular was the most important part of my transformation. And the 100 classes I’ve taken have come with the added bonus of becoming a part of a community, not just with other riders but with the fantastic instructors and staff, who are unfailingly professional, helpful, and fun. I look forward to seeing them with every ride, and that’s an important part of what keeps me going. A huge thank you to everyone at BESPOKE for their help in making this one of the best years of my life. What is your favorite music to cycle to? My own musical taste is out of the mainstream I’m rarely familiar with what’s being played in class, but it’s okay! I leave those choices to the instructors, and part of their skill is making the music work for the kind of workout they want to lead that day, and they’re all great at it. So my part is just to lock in on the beat and find the right resistance to make staying on that beat a challenge. What advice would you give a newer rider who may feel afraid to take the leap you took? I had done some spinning prior to 2018, but for the true beginner, I’d say either a community ride or an intro package is an easy way of seeing how spinning works for you. From what I observe when there are new people in the room, the staff and instructors always take special care to help take the stress out of those first few classes. Sam Spencer was nominated by Instructor Erica because of his spirit, drive, and consistency as a rider at BESPOKE! The studio instantly made him feel included, which wasn’t always his experience at other indoor cycling studios. His feelings of inclusion are extremely important to Erica because her goal as an instructor is for everyone to feel accepted in and out of class. Check out his captivating story!